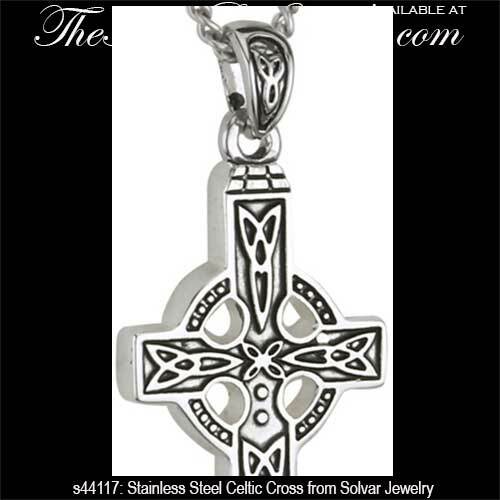 Stainless steel Celtic cross pendants are large in size and would be good choices for men. The designs on the stainless steel Celtic cross necklaces are laser engraved. In addition to the laser engraved stainless steel Celtic crosses The Irish Gift House also offer necklaces and pendants with enamel accents and filigree style designs. These stainless steel Celtic cross necklaces are large enough for men but are also fashionable enough for women. We have other large Celtic crosses that are fabricated from different metals such as our pewter Celtic cross necklaces and on our Celtic cross necklaces for men that are crafted in either sterling silver or gold. These larger pieces of Celtic jewelry have longer and heaver chains than their smaller counterparts. You may want to also take a look at our Celtic Jewelry for Men section for additional considerations in larger Irish jewelry that consists of manly pieces such as the men's Celtic necklaces and the Celtic tie tacks. 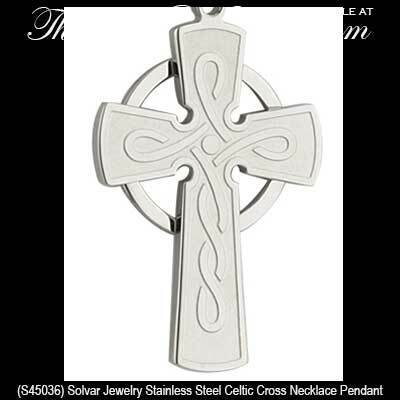 Our stainless steel Celtic cross necklaces are made in Ireland by Solvar.